Isn’t cold brew the same as iced coffee? Absolutely… NOT. With cold brew, the grounds are never introduced to hot water. On the other hand, iced coffee is brewed hot then served over ice.This difference creates a distinct flavor profile that many find preferable to regular iced or hot coffee. What makes it cold brew? Cold brew refers to a coffee brewing method that involves steeping coarse grounds in cold or room temperature water. The process usually takes about 12-24 hours; however, come brewers allow you to make it in less. One of the biggest differences between your regular cup of Joe and cold brew is the acid content. Certain oils are released from coffee beans when they are heated. This results in the high acid content of regular coffee as well as the the bitterness. Because the grounds in cold brew are never heated, these oils aren’t released. As a result, you’ll get a cup that is much lighter and smoother. The low acidity also means people who suffer from acid reflux problems might be able to enjoy this kind of coffee without a hitch. Due to the extended steeping required for cold brew, the concentrate this process produces has a much higher coffee to water ratio than regular brews. However, despite the increased concentration, cold brew generally doesn’t have an overwhelmingly strong flavor. This is also due to the lack of heat and subsequent oil release. Thus, you should end up with a palatable beverage that packs a serious caffeine punch. However, cold brew is often diluted with the usual suspects (milk, creamer, water, etc). This results in a less concentrated drink. Plus, there are a couple of other fathers that affect the strength of your coffee, including the coffee beans and steep time. The increased caffeine also means cold brew can help you burn fat post-workout, as it increases your post-energy expenditure, or after-burn effect. If you want the full low-down on the benefits of cold brew, you can check out our other article on it here. However, some of the most notable benefits come as a result of the high amount of antioxidants and free-radical fighting chemicals. The Filtron gets its bragging rights from its ease-of-use and consistency. 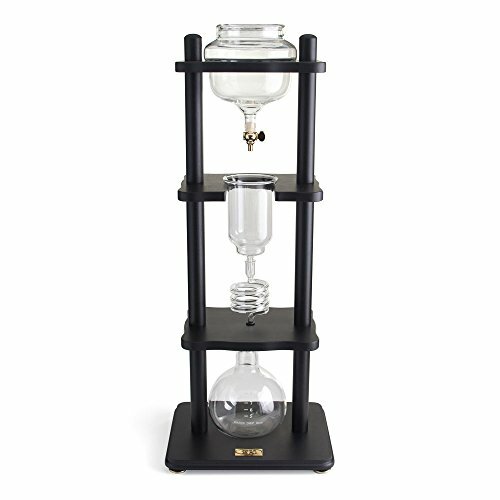 This model features measurement lines to help even total cold brew beginners. Plus, once you figure out your brewing sweet spot, they’ll help you get exactly what you want, every time. Additionally, you can store up to 1.5 liters of cold brew for about 2 weeks in this brewer. It’s also suitable for both hot and cold beverages. So even if you get tired of cold brew (though that’s unlikely), you can always mix things up. Once ordered, the product package includes a coffee bowl, water bowl, filter pad, rubber stopper, grounds guard, measuring cup, decanter, and 2 sample paper filters. Though you don’t have to use paper filters with this product, if you want to emphasize the crisp, clean taste of cold brew, we recommend getting some large commercial sized filters to pair with this brewer. For the most part, coffee lovers are usually pretty satisfied with this Filtron. However, there have been some complaints of the handle being defective and the plastic housing being cracked. So, make sure to thoroughly inspect yours when it arrives. Most users who don’t mesh well with the Filtron opt for this Toddy model instead. 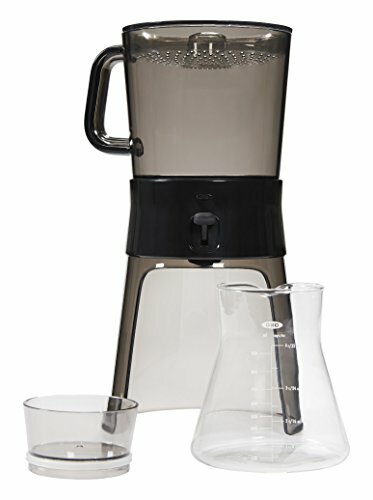 Similar in functionality though not in design, this model includes a brewing container with handle, a glass decanter with lid, 2 reusable filters, 1 rubber stopper, a set of instructions, and a recipe guide. 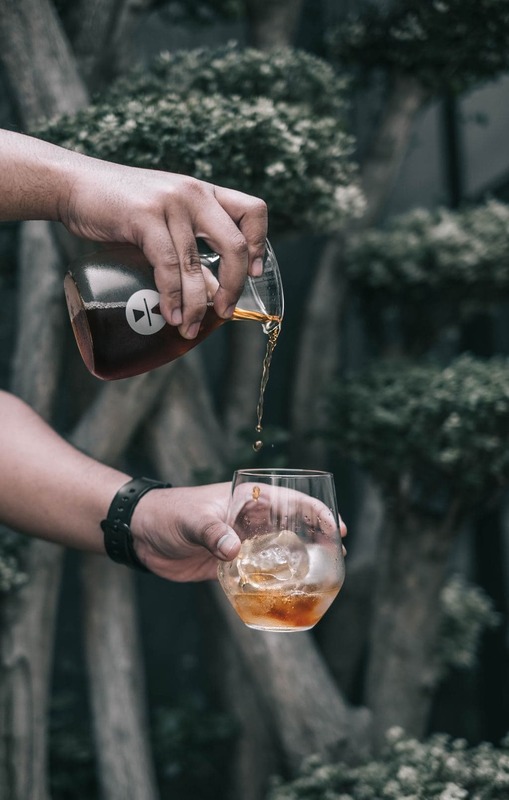 Cold brew coffee generally has a lower acid content; however, Toddy boasts an impressive 67% less acidic coffee concentrate using your regular, go-to beans. You can make about 1.5 liters at a time , and it’ll last in your fridge for 2 weeks. Talk about low maintenance! When using this product, as with most cold brew methods, make sure you have a coarse grind to prevent any grittiness. Also, make sure to maintain and replace your Toddy filter If you click this link and make a purchase, we earn a commission at no additional cost to you. regularly. If you’ve got a bigger budget or are looking to add a little intrigue to your countertop, this Kyoto-style Yama model is for you. Also, this is the best option for those looking to bring out the complex or subtle notes of single origin or otherwise special beans. With the steep price tag comes some pretty sweet upgrades to your regular cold brewer. The design allows you to get your beverage of choice in about 3-4 hours, rather than the 16-24 that most other models need. The Yama integrates quality craftsmanship down to the materials used for the system. It features non-porous borosilicate glass, meaning it’ll last you longer and you won’t have to worry about mold (which is an issue with plastic options). Additionally, the mid-century style tower is made of real wood and compliments nearly any aesthetic. Even the permanent filter is premium quality ceramic. Other than the prohibitive price, the only drawback is the size. This coffee maker has a smaller capacity than some of the cheaper options on the list at about a liter (32 oz). 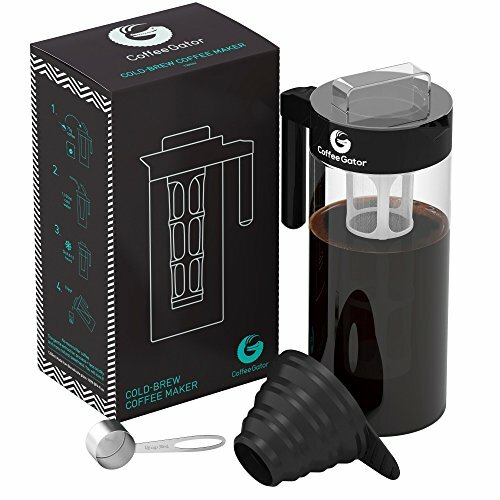 In contrast to the YAMA, the Coffee Gator is ultra-simple to use and is one of the most affordable cold brew options on the market. But don’t let the price fool you; this brewer packs a serious punch. This product includes a metal scoop, collapsible funnel, detachable grounds filter, making it both easy to use and to clean. The plastic components are BPA free and the glass is a durable borosilicate. The Gator’s carafe can hold a respectable 1.4 liters (approximately), and with proper care, it should be durable enough to last you a while. Just make sure not to rinse it with hot water immediately after taking it out of the fridge. Even if you do run into an issue with this product, Coffee Gator’s customer service is known for its responsiveness. So you should be able to get it sorted out in a jiffy. If the idea of pot-style brewing doesn’t really do it for you, the bucket-style OXO might suit you nicely. This design allows for more flexibility and experimentation for the more adventurous at-home baristas out there. While this design differs from many of the other models we’ve shown you, it’s just as user-friendly. It features a borosilicate glass carafe with clearly marked measurements, as well as a stopper to preserve freshness, an ultra fine reusable stainless steel mesh filter and, 10 paper filters. All of the components are lend themselves to easy disassembly, making for a simple clean-up. The main thing you’ll have to keep an eye out for on this model is leakage due to a faulty or worn out filter. 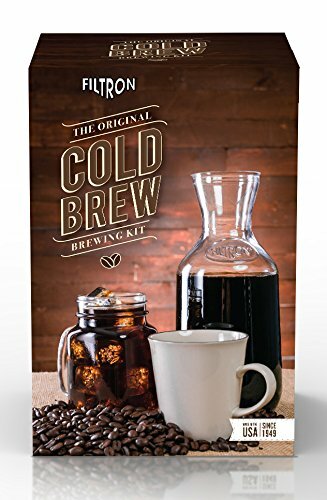 Don’t have the patience to wait 12-24 hours for cold brew? Then this automatic Cuisinart might be the brewer for you. 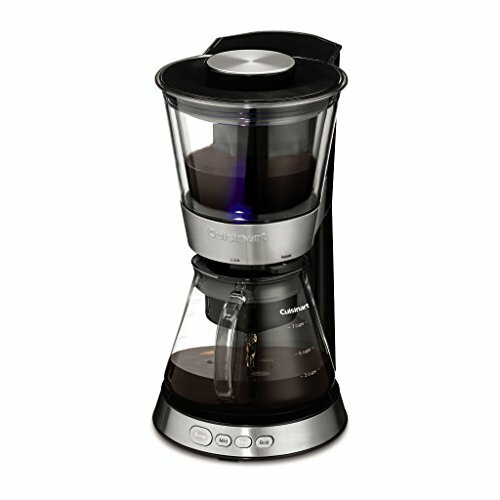 The DCB-10 can brew 7 cups of coffee in just 25-45 minutes. While the taste of the coffee you get from this machine isn’t quite as well developed as that of a more traditional method, saving a solid 11+ hours of time makes it worth it. The amount of time this machine takes depends on the strength of brew you select. Mild takes 25 minutes, medium 35, and bold 45. This machine brews your coffee by agitating the water and grounds until enough flavor has been extracted for your liking. Then, an indicator light comes on, you pull a lever, and Voila! Coffee is served. The main drawback of this machine is that there’s a chance of buildup in the removable tank. However, all removable parts are dishwasher safe, and the machine has a limited 3 year warranty. So, this shouldn’t be a major issue. With cold brew you are going to want a fresh, coarse grind. When we say fresh we mean, you-ground-it-yourself level freshness. This is because cold brew coffee tends to have a subtler, weaker flavor than regular coffee. So, having a fresh grind will help ensure that you get the most flavor possible from your beans of choice. Furthermore, the grind should be coarse to help with extraction. Because most of the brewing happens over a long steeping process, you will get better results if the water can reach more grounds. This is easier with a coarser grind. As always, size matters more than you think. Not only do you need to make sure that the footprint of your brewer can fit on your countertop, but you also have to check it’s height. If the perfect brewer is too tall to fit on the shelf of your refrigerator, it won’t do you much good. The two main styles of cold brewing systems are called immersion and slow drips. Most of the models we’ve mentioned ere fall into the immersion style, which includes two subcategories: pot and bucket. These involve submerging coarse-ground coffee in water for roughly 16 hours. Then, you simply filter and drink. Pot-style brewers tend to be a little slower and require you to pour the finished mixture through a filter. This process results in a more tea-like taste and feel. On the other hand, bucket-style mechanisms generally involve a lever or switch you interact with to allow the brew to drain through a filter and into a carafe below. The result tends to be slightly richer and more robust. Generally speaking, immersion style brewers tend to leave more sediment in your drink than drip brewers. However, using a paper filter or filtering multiple times can remedy this issue. It also tends to help highlight more rich, chocolate-y notes. In contrast, slow drip brewers tend to have a lighter mouthfeel and flavor. These models help bring out citrus and other sweeter flavors. If this is your first rodeo, it might be better to invest in one of the more user friendly models, such as the Gator, Filtron, or Toddy brewer. Look for easy assembly/disassembly, maintenance requirements, and clear volume markings for measurements. However, if you have a good bit of experience with manual brewing methods or even specifically cold brew systems, other options might be within your reach. Instead of purchasing a dedicated cold brew device, many coffee addicts simply opt to make their cold brew in a French press. You can get the full breakdown of that process here, but we’ve included some of the basics below. If you don’t already have a French press, we highly recommend trying one out. Other than that, you’ll need your favorite beans, a grinder (unless you MUST use pre-ground), water, and a spoon. You’ll simply add cold, filtered water into your fresh, coarse grounds with a ratio of about 1 part coffee to 7 parts water. Slowly and thoroughly stir the mixture. Then, put the press in your refrigerator and let steep for 12+ hours. Finally, do a full 30 second plunge, as usual, with the French press. If you’re having trouble with the grittiness of french press coffee, you can pour the coffee through a paper filter to get a little closer to the classic cold brew mouthfeel. 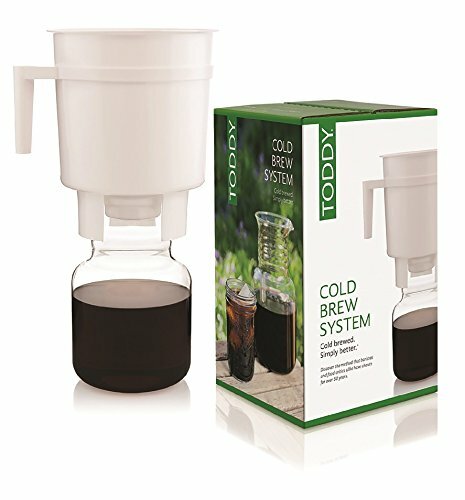 So if you are on the market for a brewing method that can give you a crisp, low-acid, energizing cup of coffee, cold brew might be for you. Any of the above models should make you a great cup of Joe. However, make sure you consider how much space you have available, what style of brewer suits your tastes, and how much experience with alternative brewing you have. With a product form this list, your favorite coffee, a little water, and some patience, you’ll be able to enjoy the light delight of cold brew coffee. In love with Kahlua and other store-bought coffee liqueurs but enjoy the artistry of at-home coffee brewing? You're in luck because we have curated this list of 11 coffee liqueur recipes that YOU can make. So it's time to treat yourself and feel a little bougie while you get a little boozy.